A hip-hop star is murdered. A notorious terrorist is freed from custody. An assassin weaves his way across Europe, setting the stage for a global catastrophe. All of them work in the shadows of an ancient organization bent on changing the course of history. Can a woman whose demons have consumed her, rid herself of the pain in time to stop them? The protagonist is a young former NSA analyst/code breaker named Mattie who has an drug addiction issue. Mattie is a key member of the new president's staff when she learns the president is part of an international group determined to impose world government. She is determined to stop the effort. Character development is excellent. There is lots of intrigue, action and suspense. This is an outstanding novel and a worthy follow up to Sedition. To understand Intention Sedition must be listened to first. Narration is superb. If you could sum up Intention in three words, what would they be? very much so!!!!! Twists and turns that go to the unexpected. Pierce is excellent as always, LOVE HIS WORK!!!!! This was Toms best book yet. It took great courage to write a book so close to what many of believe is happening in our country, I should say I believe what's happening. It's thought provoking with a list of excellent well developed characters. Kevin does his usual excellent 5 star narrative. I recommend this book to all my friends concerned about the direction of our country. Great book, no vulgar language. 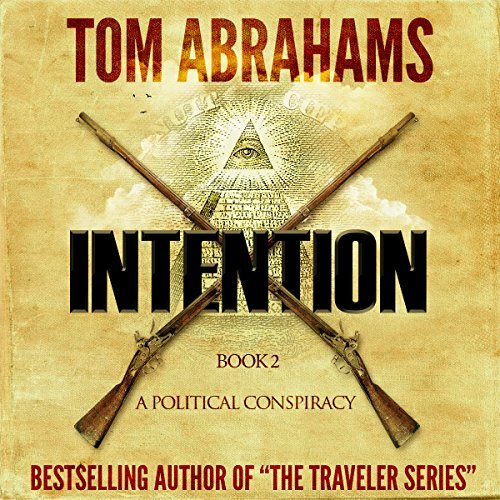 Great book by Tom Abraham's with no foul language. It's nice to listen to books where you don't have to listen to vulgar language. Great job! Good story and character development.Really like this and the other series written by this author. Kevin Pierce could read the phone book and make it rivetting! Looking forward to the next installment. Is it Abrahams or Pierce? Love the writing and the superb narration. I'm hooked. Abrahams spins a compelling tale and Kevin Pierce brings it to life. Great team. Great read/listen! Thanks to both of you! So...what's next gentlemen?